G-Suite helps you and your team connect and get work done from anywhere on any device. G-Suite is a cloud-based productivity suite, so it’s simple to setup, use and manage with Gmail, Hangouts, Calendar, Google+, Drive, Docs, Sheets, Forms, Slides, Sites, Admin and Vault. So G-Suite is allowing us to work smarter and that's really our requirement. G-Suite provides professional and ad free email account with 30GB space and it is also compatible with other email clients. G-Suite's text chats, voice calls or video calls with built-in screen sharing are saving money and time from anywhere. Calendar events are easy to schedule and share with full event details to all coworkers quickly by checking availability. Using powerful Google+ android and iOS app, keep the whole team connected form anywhere. Using Drive tools, data is safe and secure and G Suite plan is offering cloud storage where the whole team can store data. Real-time docs can create and edit and no dedicated software is required and multiple user can also work at the same time. Spreadsheets are easy to create and edit in browser without dedicated software. All features of spreadsheets can be used in browser like Data analysis, chart and pivot tables. Custom form and professional looking surveys can be created, managed as well as analyze responses with automatic summaries. Slides can be created and edited in browser using Slides without software and multiple people can work at the same time. A site can be created without programming and designing skills and is easy to edit. Sites look good in all browsers. New user can add or edit and configure security settings with with good administrator interface. Google's Cloud platform is an inherent part of exactly how Google helps in enabling collaboration due to its abundant storage feature. You can never face a downtime with an offering of 99.9% uptime guarantee from G Suite.  Never feel that work will be hampered anymore as now G Suite offers you good and smart mobile support along with its complete suite of apps. G Suite is enabled with strong encryption and multi factor certifications & authentication for securing data transmitted over the internet to be stock piled in data centers. Google provides prompt 24/7 Support for helping you out with any issues that may crop up. © 2019 Everdata Technologies Pvt. Ltd. | All rights reserved.